Your playlists almost certainly contain some tracks you don’t own — tracks you stream from Spotify’s library and haven’t bought or ripped from CDs. 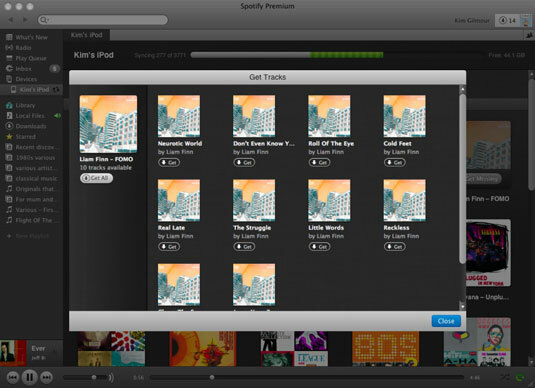 Spotify makes it easy for you to get these missing tracks as MP3 files, and then syncs these to your iPod. Here, you have 14 spare downloads to use up, as shown by the number next to the account button on the top-right of the Spotify window. In this example, you’re downloading the latest album by Liam Finn (son of Crowded House’s Neil Finn), which was previously saved as a playlist. When you click Get Missing, a window appears, showing all the tracks you need to download. By the way, if you don’t have any download bundles available, you’re prompted to purchase one at this stage. The download bundles represent good value (as opposed to £1.15 for one single track), but they must be used up within 30 days. Click Get All, and tracks start to download immediately if you previously indicated that you want your password saved for purchasing purposes. Or, a prompt appears asking you to retype your Spotify password and verify the transaction. You can safely close the window and go to your Downloads page to see how your downloads are progressing. 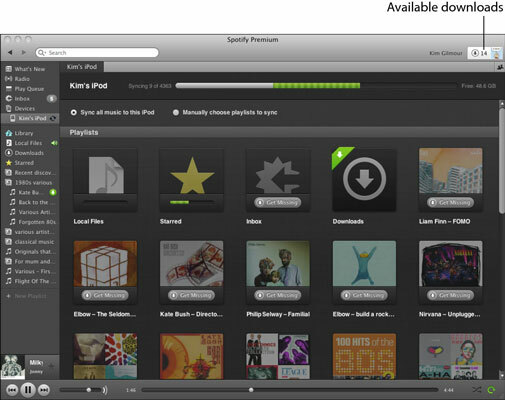 All this while, the iPod is still syncing, and there’s music playing — Spotify is truly one mighty multitasker! If a download doesn’t complete correctly, an exclamation mark appears next to the track the next time you launch the app. Click Download under the Re-Downloads column to finish the procedure.